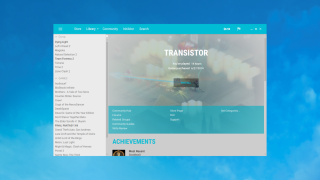 The best Steam skins to make your client beautiful. Steam has looked the same for a long time. It may not be green anymore, but gray gets tiring, too. Why not make it snazzier? Refresh your game library with new colors, fonts, and roomier layouts using the best Steam skins. Skins are very easy to install, so you can switch between them whenever you like using a dropdown menu and quickly reset to default if it all gets a bit much. And if you want to get really fancy, consider finding custom grid view icons for your library. Let's run through the install process first, before moving on to our favorite skins. Head to the Interface section of your Steam Settings. Pick the skin you want from the "select the skin you wish Steam to use" drop down menu. Sit back as your eyes thank you for making the world a little bit more beautiful. Voila. Steam makes it very easy to install multiple skins, so you can download a few and then flick between them to test them out, and find the skin that's right for you. Head to page two for our roundup of the best Steam skins.